ARE CURRENT DOG ON DOG MAULING LAWS UNJUST? TWO BLOGS. ONE MESSAGE. Today I have an important question for you. Are current dog on dog mauling laws unjust? Maybe you haven’t given this topic much thought. Maybe you know little or nothing about animal rights and injustices. But don’t worry. I can help change that, which is why I am now focusing on this particular blog category. Animal Laws And Rights. This blog is a departure from the types of stories I usually publish on my site. If what I write and communicate helps make a difference, I hope to continue featuring topics like these that catch my attention. When issues arise in your community, in your neighborhood, and in your county, you are more likely to act. I was appalled when I read about Rocky on my local Nextdoor online network. The incident occurred about one mile from where I live, in a community where I have had numerous pet clients over the years. I reached out to the family in question and offered to help in any way I could. That’s why I’m asking you to please comment and let me know what you think. And, also, I would be delighted if you told me about the injustices that are close to your heart so I can write about them, too. My Three Chosen Stories: Rocky, Buckles, and Reese. August 2018. On Friday the 11th to be exact, just past midnight, Olesa Fridman walked down one flight of stairs at her condo with her 15 pound, five-year-old companion. 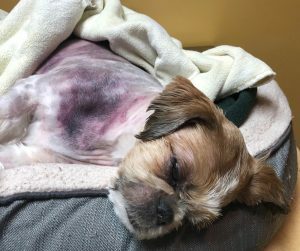 The downstairs neighbor’s 60lb dog ran out of nowhere and attacked Rocky, one of the family’s two Shih Tzus. Alerted by her screams, husband Oleg ran out and kicked the aggressive dog. It let go of Rocky who then took off running for his life. But, in full prey drive mode, the much larger, faster, attacking animal caught up with him and mauled Rocky a second time. Oleg chased after them and managed to kick the dog again. It released hold of Rocky but, despite his injuries, he was able to run away. Searching for him continued throughout the early morning hours until night-time, with only a two-hour break. Rocky wasn’t found until late that night but, sadly, he was badly wounded. The Fridmans rushed him to the nearest emergency clinic where they took x-rays, cleaned his wounds, administered pain meds and antibiotics, and allowed him to go home. But Rocky’s condition was worsening. He required hospitalization and was taken to BluePearl in Tampa for intensive care. Possible leg amputation was mentioned but a full evaluation would be done in the morning by the surgical team. So, Olesa and Oleg returned home but within a few hours, received a call with the worst possible news. Rocky had sepsis and was not responding to the antibiotics. His sugar level was so low they could no longer read it. His kidneys were failing. So they hurried back to the hospital with other family members to say their final goodbyes. But this opening story doesn’t end here. 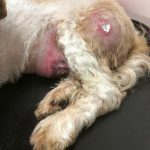 Please continue by clicking this link https://petpeevesunmasked.com/seeking-justice-for-dog-on-dog-maulings/ to read about two other mauling incidents that had rather different outcomes. And find answers to the question…are current dog on dog mauling laws unjust?